Third Person Press: Grey Area Launches October 24th! Grey Area Launches October 24th! 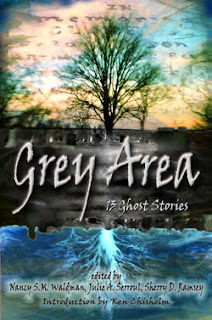 Our newest anthology, Grey Area: 13 Ghost Stories launches on October 24th, and we're getting excited! The launch takes place at the McConnell Memorial Library, 50 Falmouth Street in Sydney, from 6:30 to 8:30 p.m. There'll be readings, refreshments, and of course the opportunity to buy the book! If you're a supporter of the Indiegogo campaign, you'll be able to pick up your perks at the launch. Grey Area includes stories from thirteen Cape Breton writers: Hugh R. MacDonald, Meggan Howatson, Leah Noble, D.C. Troicuk, Nancy S.M. Waldman, Charlotte Musial, Voula Kappas-Dunn, Julie A. Serroul, Nancy MacLean, Diane J. Sober, Katrina Nicholson, Theresa Dugas, and Sherry D. Ramsey. The book will be for sale through the Third Person Press website and at online retailers in both print and ebook formats following the launch.